Last week I got a chance to participate in a group mountain bike ride near Yosemite, up to a lookout station called Devil's Peak. The ride was organized by the Tenaya Lodge, and I rode a rented hardtail mountain bike with worn out shocks on the front. The ride was basically an up-and-back climb, riding up a road that starts paved and gets gradually more primitive as it gains altitude. Almost all the way up it's a comfortable fire road, but the last mile near the top gets a little steeper and considerably more rocky. With my always-modest mountain bike handling skills atrophied from years of disuse, that last mile was a bit of a challenge. The peak is at about 6900 feet, and has the panoramic view you would expect. It's a suitable reward for the effort, and photographs just don't do it justice. One of our guides was apparently a park ranger, and he gave us a combined geographical and historical tour of the area by naming the neighboring peaks and then explaining the history behind those names. I was worried about descending that rocky bit near the top, but in the event it wasn't too difficult, even with the traffic of my fellow riders. On the way down we took the opportunity to try two sections of single-track, which was plenty of fun but still well within my meager abilities. Near the end was a two-mile climb, not particularly steep but seemingly never-ending. The sharp peak isn't real; the elevation drifted over lunch. The whole ride was about 23 miles. The elevation on my Garmin drifted up about 200 feet while we ate lunch at the top, so while I recorded about 3000 feet of climbing, I wouldn't swear to it. The most difficult kilometer was certainly the one near the peak, not only because it was steeper, but also because of the quality of the road, and of course the altitude. Yesterday I did something I thought I might never get to do: I rode my bike to the very top of Mount Umunhum. 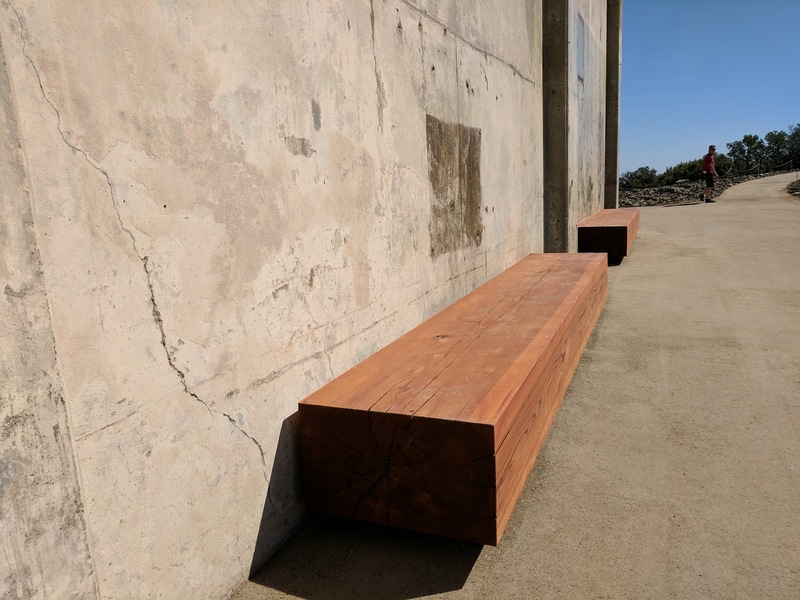 Mount Umunhum has been infamously inaccessible for years, but finally opened to the public on September 18, 2017. I've been poking around Umunhum for a long time -- my first post on this blog described a ride in 2010 from Loma Prieta to near the top of Umunhum. According to everything I can piece together, my first ride in the area was April of 2009, when I only made it up to Barlow Road. A month later I made it all the way up to the yellow gates, past the "legal" limit. A perspective I've been waiting for. 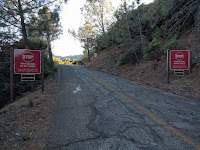 In the years since I've ridden on and around Mount Umunhum several times (and written about it: 1, 2, 3, 4, 5, 6), always stopping at the annoying signs. Well, almost always. When the opening was announced I was very excited, but last weekend I was out of town, so yesterday was my first chance. I was concerned that there would be a lot of traffic, which while true turned out not to be a problem. As has been true for the last couple of years, most of the cycling I do these days is just commuting, and these days I don't even have an excuse to pass through the hills near Saratoga. 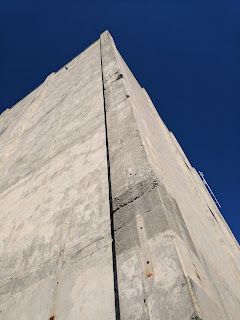 I was sternly reminded of my lack of climbing when Hicks turned upward. 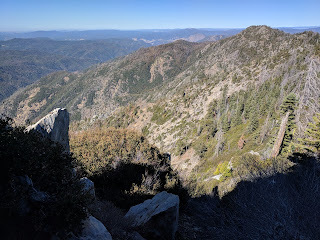 When I got to the top of Hicks, the parking lot at the base of Mount Umunhum Road was full and all the feasible parking along the road was occupied as well. I've never seen more than one or two cars in that lot. There were also a lot of cyclists on the road. I would guess that most of the time I've spent on Mt. 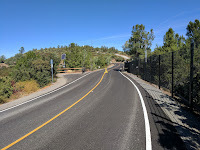 Umunhum Road has been entirely alone. In my numerous trips I may have seen one or two other riders, but it's been rare. This time, there were dozens. At the Bald Mountain trailhead, previously the end of the line for cars, a park ranger was turning cars back. Apparently the summit parking lot was full, so they were only letting cars up as they came down, one for one. And of course the Bald Mountain parking lot was full as well. 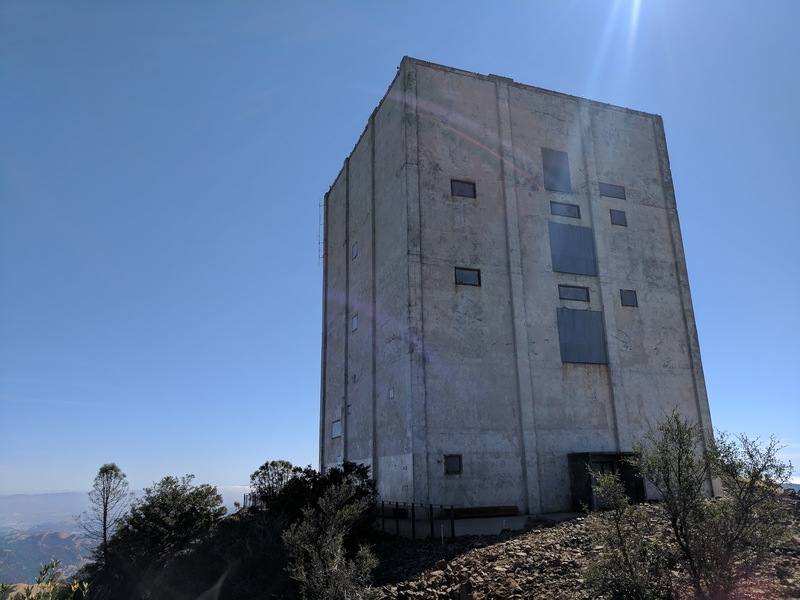 I expect that this won't keep up; Mount Umunhum will never be as isolated as it used to be, but it'll settle down after the initial interest falls away through autumn. Look how nice the road is! Since they were turning around cars, there was very little traffic to deal with on the last stretch of road. And what a road! What had been a pitted, crumbly mess, where you had to pick your line on the climb as if it were a mountain bike trail, is now a perfect surface. this time in February 2011. 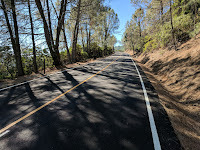 It was a joy to pass by the road to Loma Prieta, after a recent report that even that stretch could open in my lifetime. Maybe the popularity of Mount Umunhum will lead to some momentum on that front? I came around to where the gate used to be, reaching as far along this road as I've ever been. I've skirted a few gates in my time, but this one had cameras, and I assumed that my messing around here would at some point cause someone to be dispatched to check it out. That seemed unfair to them, so this was a line I had never crossed before. As it happens, this point also marks the end of the main climb. From here the road is flat or descending for almost a mile, before one final kick up to the top. The junction with the road that leads over to Mount Thayer comes just before that final kick. It appears to be a ranger facility, with a parking lot where the Air Force station housing used to be. I didn't look too closely, but I saw no other trace of that little village remaining. That's the best outcome, of course, but I still wish I had got a chance to see it as a ghost town before they returned the area to nature. At the top it's all about the tower, and the views. The whole valley was laid out, under an unfortunately distinct layer of brown haze. On the other side you can see over the mountains all the way to Monterey Bay. There is such an advantage to reaching the very top of a mountain, compared to any spot lower down. I'm so glad that Mount Umunhum joins the set of accessible peaks in the area. Now it's time to work on Loma Prieta and Black Mountain. The views are the enduring value, but it's the tower that demands your attention. Even bigger in person than I had imagined, it provides a focal point for the whole ride, and finally reaching it after all these years was wonderful. In the past I've thought it might be best to let the tower go, but now after seeing it in place, plus a photo in the shelter of what it looked like with a bright red and white checkered radar dish on top, I can see what we need to do: preserve the tower, and in fact rebuild the dish. Wouldn't a colorful hat be the perfect decoration for that tower? I spent quite a while at the top, soaking in all these new amenities, and then finally started the long descent. 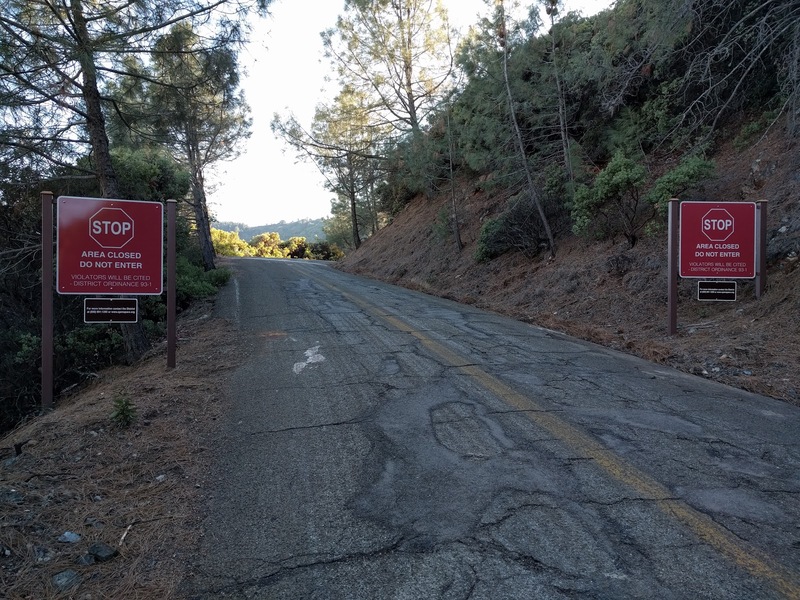 I've noted before that the descent here was unpleasant -- it was too steep, and the road was full of dangerous potholes that could send you careening off the unguarded side of the road into a ravine. 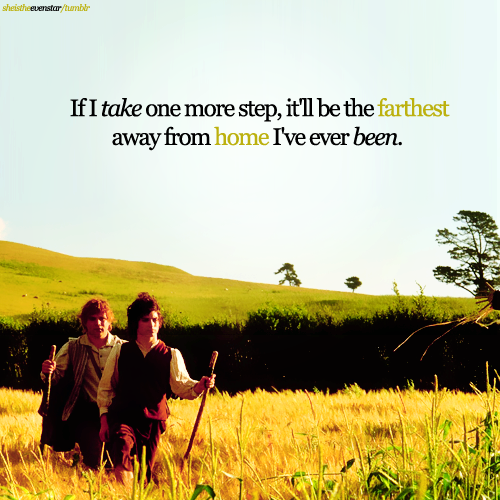 And it used to be so isolated that it wasn't a question of whether you'd survive, but whether you'd even be found. None of that is true anymore; the road is now a pleasure to descend, with just a little traffic, both cars and bikes, to deal with. The rest of my ride was a descent through New Almaden, then home. I've been waiting a long time for this. I'm so glad that Mount Umunhum is finally accessible, and apparently quite popular. I'll be visiting again pretty frequently, I think, and encourage you to do so as well. But there will only be one first time I've seen all this, and that was today. Yesterday's ride was just under 30 miles, with 3300 feet of climbing. The toughest kilometer was that first kilometer after Hicks starts climbing, as usual. That first half of the Hicks climb averages 14%. The whole 5-mile climb, including both Hicks and Mt. 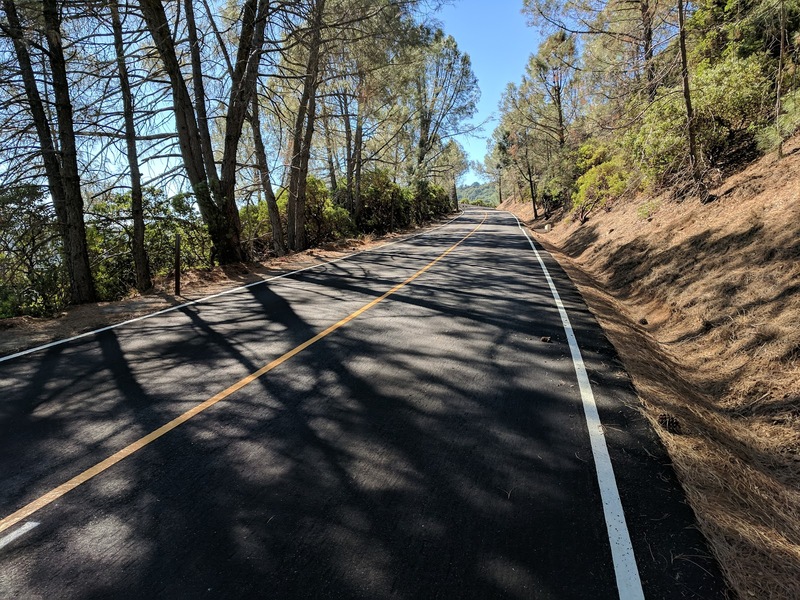 Umunhum Road, averages very nearly 10%, despite the brief flatter parts. That's one steep climb.